I think I've mentioned on here before about how much I enjoy the first few days of working on a new book. Well, that's not always the case. Sunday I started a new one, the third book of a series in which I've also written the first two. I struggled through a couple of pages before giving up in disgust. The words weren't flowing, I didn't like what I had written, and I had a sense that it just wasn't right. The first two books in this series were written in a fairly distinctive voice that's somewhat different from my normal style, and for whatever reason, I just wasn't able to write in that voice. Monday I had to run errands all day, so I didn't get back to the book. Tuesday I had some unexpected real-life problems to deal with, so I didn't write any then, either. So this morning I approached the computer with some trepidation. I felt like I could do it, but I wasn't sure. And there's no leeway in the schedule. This book has to be written now. Luckily, when I began going over the two pages I wrote Sunday, I could see what was wrong with them and knew how to fix it. Once that was done I started adding new pages, and while I'm still not completely satisfied with them, I was able to have a pretty productive day. The voice of this series is back. Maybe a little hoarse and strained, but with some extra work I think it'll be okay. That's quite a weight off my mind. I've never had a case of really bad writer's block and sometimes I'm not sure such a thing really exists . . . but I worry about it anyway, in the back of my mind, in the middle of the night. What happens if the other shoe ever drops and I can't do it anymore? It's an unsettling thing to think about. A few days ago, Bill Crider posted about this anthology from 1952, especially Ray Bradbury's story "Kaleidoscope". I didn't remember the story, so today when I was at the library and happened to see the book on the shelf, I checked it out, figuring I would reread the Bradbury story. Only when I started reading it, I realized I'd never read it before. Looking at the table of contents, I don't think I ever read this book, although I read other anthologies edited by Groff Conklin. And it's quite a line-up, too, over 500 pages of stories culled from the SF pulps of the Thirties and Forties and the digests of the Fifties. So now, even though I don't really have time to do so, I have to read this book. Luckily, I can shoehorn short stories in between all the research reading I have to do. By the way, "Kaleidoscope" is a great story. I can see why it stuck in Bill's mind. Since I commented on the World Series and the Super Bowl, I suppose I ought to say something about the NBA championship. Don't expect any sort of analysis, though, because I only watched bits and pieces of some of the games, including tonight's. First of all, I'm glad the Spurs won, if only because their style of play is slightly less boring than Detroit's. Last year I rooted for Detroit to knock off the Lakers, but that was more about rooting against the Lakers (mainly Kobe Bryant -- I'm no Shaq fan, but I've got nothing against him). Overall, though, I hate the style of play in the Eastern Conference and didn't want to see Detroit win with it again. When I turned the game on tonight, it was almost down to the five-minute mark in the third quarter, and neither team had scored 50 points yet. I almost turned it off then and said neither team deserved to win. It got a little better, but not much. I became an NBA fan during the Sixties and Seventies, when the average scores were higher and the games much more entertaining. But that's sure not the trend now. And why doesn't the NBA championship have a cool name like the World Series or the Super Bowl? Oh, well, NFL training camps open in about a month. Something to look forward to. BORDER RAIDERS is the second novel in James J. Griffin's series about Texas Ranger Jim Blawcyzk, and it's even better than the first one, TROUBLE RIDES THE TEXAS PACIFIC. The previous book had some strong mystery elements, but BORDER RAIDERS is pure Western adventure, perhaps closer in tone to a war novel than anything else. The plot is simple: Blawcyzk becomes the second-in-command of a troop of some fifty Rangers sent to the Nueces Strip in South Texas to put a stop to the rustling going on there, and while they're at it, they have to track down a band of renegade Comanche warriors, too. The pace is rather leisurely at first, as Griffin does a good job of introducing the various Rangers, but once the action starts it seldom lets up, and by the end of the book the reader can't be sure which of the Rangers will make it back alive and which ones won't. 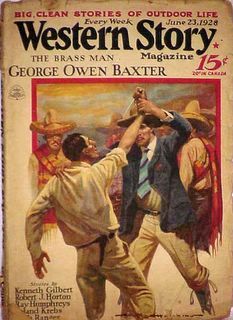 This is a fine traditional Western, the sort of book that probably would have easily found a home with a major publisher in an earlier time when the market was stronger. It's available from the various on-line booksellers and from the publisher, iUniverse. In recent days both Lee Goldberg and Bill Crider have linked to an article about Donald Hamilton's Matt Helm in both movies and books. Well, I had to go read that article, of course, and it's very good. But the website where it can be found is also one of the most interesting I've run across. Where else are you going to read articles about the Nick Carter, Killmaster series, the Black Samurai novels from the Seventies, and Edward S. Aaron's Sam Durrell books, also, along with Matt Helm, one of the best espionage series around? Whoever writes these reviews doesn't take them too seriously. 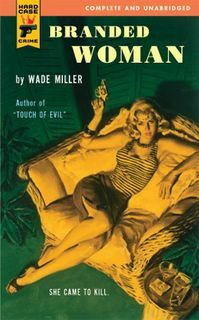 Discussing the way authors usually describe characters in espionage thrillers, he writes, "Men with strong jawlines generally hang out with women who have proud breasts". And describing the men who run the intelligence agencies which employ the heroes: " . . . your standard issue 'old guy in charge of the most elite secret agency in the United States.' These guys are always named Hawke or Arch Angel or Mr. Falcon. I've noticed that good guys are always named after the whole bird, and evil guys are always named after parts of the bird, like Talon or Klaw or Wings Hauser." The image I posted of Ace Double D-18 came from an absolutely wonderful website that lists and has images of many of the Ace Doubles in all genres. If you're a paperback fan and have never been to this site, I recommend taking a look immediately -- but only if you have some time, because you'll probably be there a while! Ace Double D-18 -- This is the book Bill mentions in his comment below, with the same cover artwork as the pulp I posted Sunday. 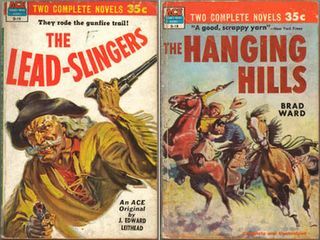 J. Edward Leithead is one of my favorite pulp Western authors. Brad Ward is the pseudonym of Samuel Peeples, whose work I haven't read yet. Robert B. Parker writes 160 page paperbacks cleverly disguised as 300 page hardbacks. That explains why somebody like me, who grew up reading 160 page paperbacks, generally likes Parker's books and continues to read them. But having said that, the most recent Spenser novel, COLD SERVICE, is a pretty rough go. To give it a "Friends"-like title, this is The One Where Hawk Gets Shot. That's not a spoiler, because it really happens before the book even starts. I don't read Parker for the plots. Out of the past dozen or so Spenser novels, I don't remember anything about the plots except for two or three of them. But it seems even thinner than usual here, the dialogue's not funny, and the posturing and the terse-but-deep philosophical conversations are getting tired. Or I'm getting tired of them. Or maybe Parker's getting tired of Spenser. I know my favorites of his novels over the past few years have been non-series books like GUNMAN'S RHAPSODY and DOUBLE PLAY. In fact, I'm looking forward to his new Western, APPALOOSA. And I'll read the next Spenser when it comes out, too. I've seen Parker go through slumps before and come out of them. But as for COLD SERVICE, I just didn't like it very much. I was a regular reader of comic books for years, decades, even, and I nearly always read BATMAN and DETECTIVE COMICS and every other title that had Batman in it. He's easily my favorite character from the DC Universe. I haven't been reading many comics at all in recent years, though, and I'll probably wait for the DVD of the new Batman movie. However, I recently had the opportunity to read a couple of trade paperbacks that collect a year-long story arc from BATMAN called "Hush". 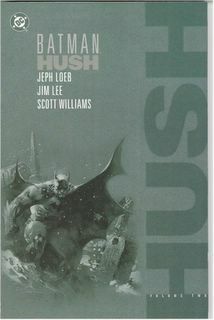 The writer on these is Jeph Loeb, who I think is one of the best modern-day comics writers, and the art is by the very popular Jim Lee, with inks by Scott Williams. The story is set in present-day Batman continuity, and since I've been out of touch for a while, there were several things that surprised me quite a bit . . . like the fact that Lex Luthor is now the President of the United States and Bruce Wayne owns the Daily Planet. 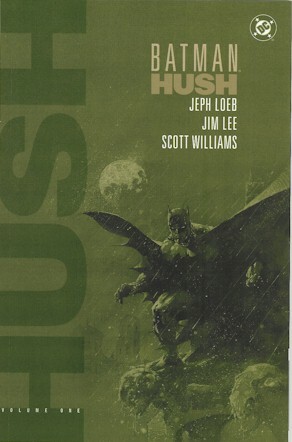 I got up to speed pretty quickly, though, and was thoroughly caught up in this tale of a mysterious mastermind called Hush who seems to know all of Batman's secrets, including his life as Bruce Wayne. This enigmatic figure enlists a lot of Batman's old foes, feeds them important information, teaches them new ways to approach their battles with their old enemy, and generally makes Batman's life a living hell. This is a wonderful story, probably the best Batman story I've read since the early Seventies, when Denny O'Neil and Neal Adams were producing classics like "Night of the Reaper". Loeb's writing is sharp, and the plot has enough twists and turns to keep even the canniest reader off-balance. I thought I had everything figured out several times, only to have some new surprise come along. Lee's very detailed artwork is good, although there were a few times when I had a little trouble following the action. Comic book storytelling has evolved over the years, of course, and I'm a traditionalist, so the art in modern comic books never grabs me like that of, say, Jack Kirby. Overall, I highly recommend both volumes of BATMAN: HUSH. And I'm a comic book curmudgeon. For the past several days over on Lee Goldberg's blog, there's been a fascinating -- and exhausting -- discussion going on about fanfiction. Now, I'll admit that I've never given much thought to fanfiction. On two occasions in my past, however, I've written things that would now fit the definition of fanfic. In 1966, when I was in junior high, I wrote a Tarzan "novel". Since it was written in longhand, I'm not sure how long it really was, probably closer to a 20,000 to 25,000 word novella. I was a Tarzan fan, and I was also a huge fan of the secret agent craze that was going on then, so I combined the two and had Tarzan help out some espionage agents who were on a secret mission in Africa. Then, a few years later, I wrote about a hundred pages of a Lone Ranger novel. I was watching Lone Ranger reruns on TV every day, no surprise. That one used the creaky old plot of having the Ranger get grazed on the head by a bullet, and when he woke up he didn't remember who he was. 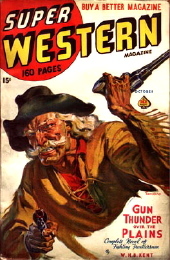 Meanwhile, some bad guy pretends to be the Lone Ranger. Yes, it was terrible, but if I remember correctly, the writing wasn't too bad. Neither of these stories will ever see the light of day again, because I have no idea where the manuscripts are. Even if I did, it's highly unlikely I'd ever post them on the Internet or anything like that. I mean, the Lone Ranger story wasn't even finished! I had a great time writing them, but I was a kid and easily entertained. No one has ever read them but me, and that's probably as it should be. The point of this reminiscence is that for the past couple of years I've been a member of an email list devoted to Burroughs called erb-list. I usually just lurk and don't post much, but I enjoy reading all the messages. The membership is very articulate and enthusiastic. The moderator is trying to increase the membership, so I thought I'd plug the list here. If you're a Burroughs fan or just interested in learning more about him and his work, you can visit the erb-list website, where you can join the list or just browse through pages and pages devoted to ERB. It's one of the best Burroughs sites you'll ever find. Above is an early look at the cover of the first book in a new series debuting from Berkley this fall. I like the artwork but can't tell if it's actually from a Charlie Russell painting or just inspired by Russell. Either way I think it looks good. Initiative and self-reliance are fine things, but there comes a time when you have to realize you're just being a stubborn damn fool. Accordingly, today we called in a couple of plumbing professionals, who promptly fixed in an afternoon the stuff we've been struggling with for the past month. Now, don't get me wrong -- by doing the work we did, we saved ourselves probably several hundred dollars -- but I'm really glad that someone who knew what he was doing finished up the job. Tomorrow I get back to work on the writing. Really. I didn't mean to go so long between posts. Work and real life caught up to me in the past week or so. Tuesday through Friday of last week, I didn't do much of anything except sit at the computer and write, so there wasn't really anything to say about those days. 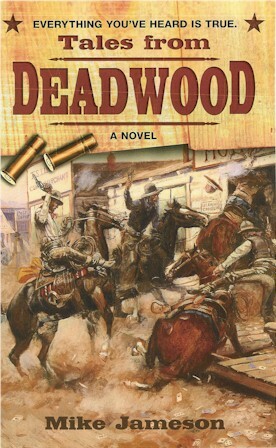 I'd set myself a goal of getting to a certain point in the book I'm writing by this past Saturday, because I wanted to take that day off and go down to Cross Plains, Texas, for part of the annual Robert E. Howard Days get-together. If you've noticed the photo just under this post, you know I made my goal (by 3 pages!) and spent Saturday in Cross Plains having a great time seeing old friends and meeting some folks I knew from the Internet but had never met in person. The Brownwood Bulletin even published an article about REH Days, focusing for some reason on the panel I did with Indiana Bill Cavalier. (Thanks to Bill Crider for the heads-up about this.) Indy and I both look quite distinguished, I think. While I was there, I picked up a copy of the new REH collection from the University of Nebraska's Bison Books imprint, BOXING STORIES, edited by Chris Gruber, which restores for the first time the full version of Howard's novella "Iron Men" (the edited version, with 10,000 words cut out of it by Jack Byrne, was previously published in several places under the title "The Iron Man"), along with a good selection of Howard's other boxing stories. This is a very nice-looking trade paperback, with a cover by Gary Gianni. I spent most of Sunday in the two-foot-tall crawl space under the house rasslin' with balky drain pipes. I got a little claustrophobic after a while. Today was spent going to Home Depot and Lowe's for more ammunition in the Great Plumbing War, as well as stops at a couple of libraries to return books. I plan to get back to work tomorrow and will probably try to do another sprint for the weekend, although I don't plan to go anywhere this time. I just want to get pages done. 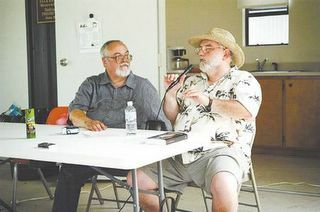 Photo by Gene Deason -- James Reasoner, left, and Bill Cavalier, both published Robert E. Howard researchers and enthusiasts, lead a seminar Saturday during Robert E. Howard Days in Cross Plains. The topic was what Howard might have done had he lived longer than age 30. Is this a great cover or what? The book should be available soon from Hardcase Crime. I've read the original Gold Medal edition, and like all the Wade Miller novels I've read, it's really good. "So why has Robert B. Parker, the hugely successful author of more than 30 Spenser novels, written a western? He clearly didn't write it to compete with dark, violent revisionist works like "Unforgiven" or "Deadwood." Nor is "Appaloosa" an ambitious epic on the scale of McMurtry's "Lonesome Dove." Rather, Parker seems to have written "Appaloosa" as an exercise in pure, old-fashioned storytelling, and on those terms it succeeds quite well. Parker takes material we have all known for years -- gunslingers, saloons, shady ladies, shootouts, Indian raids -- and brings it to life with writing that is fresh, fast and sure. "Appaloosa" is by no means profound, nor is it meant to be. But it is the work of a master craftsman, and reading it is exciting and fun." Since Mickey is one of my all-time favorite writers, I'll definitely be sending him a card. We watched this movie tonight, and even though I'd already seen it at least five or six times, I still thoroughly enjoyed it. This is one that really holds up. The pace is a little slow at times, especially for somebody used to modern movies. On the other hand, the action scenes are well staged and photographed so that you can actually tell what's going on (as opposed to the close-up, quick-cut, confusing action scenes common in today's films). My daughter Joanna is becoming a Cary Grant fan (although she likes him better in comedies and romances), and she allowed that GUNGA DIN is a pretty good movie. I think Grant is great in this one, as are Victor McLaglen, Douglas Fairbanks Jr., and Sam Jaffe. This is still one of my all-time favorites and a grand adventure movie. Just thought I'd mention that today is my 52nd birthday. I used to hear my brother-in-law talk about how no matter how old he got, he still felt about 16 inside. I know how he feels. In a lot of ways I never grew up. Or as I've said to my wife many times, "Just how much maturity do you expect from a guy who makes up stories about cowboys for a living?" Of course at other times I feel like I'm about 102, such as when I've spent a couple of days trying to fix our clothes dryer and the blasted thing still doesn't work. If there are any plumbers or appliance repairmen out there who work cheap, come on down! Have I got some work for you! In the meantime, the writing continues to go well, and I'm reading THE GOLDEN GROTTO, a Shadow pulp novel from 1933. A lot of you reading this have probably already seen PITCH BLACK, since it came out at least five years ago. But I'd never seen it, so on my daughter Shayna's recommendation (she's an even bigger science fiction fan than I am), we watched it tonight. I enjoyed it quite a bit and thought it was a very well-made movie. There was a lot of genuine suspense and some surprises along the way. As we were watching it, I made the comment that Vin Diesel is a pretty good actor in the right parts, but later it struck me that that was an unfair assessment. You can say that about almost every actor. Hugh Grant as Riddick just isn't going to work. It's enough to say that Diesel is very good in PITCH BLACK. Shayna liked the sequel even better. I'm thinking we'll probably get around to it soon. The work is still going well, even better than yesterday, in fact. Between sawing boards and climbing in and out of the four-foot-square hole in our utility room floor (to be fair, Livia did a lot more of both those things than I did), I started writing a new book today. I really love the first day at work on a new book. New characters, new situations and settings, and a new voice and style from the last one I did. Sure, it won't be this much fun all the way through, but for now I'm enjoying it a lot. I'm even anxious to get back to work on it tomorrow. Richard Wheeler continues pinch-hitting admirably for Ed Gorman with a nice essay about how it used to be physically harder to writer books before computers. He's absolutely right. My first two novels were written in longhand, with a fountain pen, in spiral notebooks. Then they were typed and revised and typed yet again. I'm convinced computers made me a better writer. On some stories in the old days, things didn't get changed that probably should have simply because it was too much trouble to retype the whole thing. For the past couple of days I've been reading MORGAN THE PIRATE by Robert Carse, the Dell paperback novelization of that 1961 Steve Reeves movie I mentioned a while back. I'm going to be writing a review of this one for a magazine, so I'll reserve comment on it for now other than to say that I'm enjoying it so far. No movie tonight, but my daughters came home from the library with a DVD of GUNGA DIN. Joanna asked, "Isn't this the movie you said you liked?" (I had mentioned it for some reason not long ago.) I haven't seen it for years and am very eager to watch it again. It's one of the relatively few movies from that era I've seen on a big screen. In the Seventies, one of the theaters in Fort Worth operated as a revival house for a while, and I vividly remember going to a double feature of GUNGA DIN and THE OUTLAW with a couple of friends of mine, Bruce Washburn (now my brother-in-law, as a matter of fact) and Leland DeBusk, who unfortunately passed away a year or so ago. I think we were the only customers in the theater. Another time we attended a Marx Brothers triple feature in the same theater, and it did better business, including three guys who came dressed as Groucho, Chico, and Harpo. They showed up at every Marx Brothers revival in the Dallas/Fort Worth area, always in costume and in character. I must have run into them a dozen times over the years. I like the Marx Brothers but never had the urge to attend their movies in costume. Closest I ever came was when several of us all wore fedoras to a CASABLANCA revival. Come to think of it, that may have been a little odd, too . . .